Its been a few days since the race, and I have been procrastinating over writing about it ever since. Here it is finally -- I finished the 21K in 2:19:02, nearly 10 minutes faster than what I did in Mumbai earlier in the year, something I had not at all expected before the start -- I was only hoping to finish it under 2:30 hours, just as I had done in Mumbai! As it turned out, I had a pretty terrific start by my standards. And the morning weather was perfect for running. Saw the frontrunners (Merga et al) coming back as I was nearing the 6K mark -- and those folks were on their 14th K! 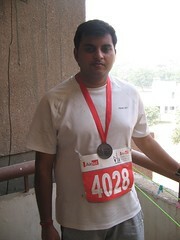 10K was done in 1:03:05 -- the fastest 10K I've done till date. Once I realized that, I knew that a sub-2:20 was always on the cards. Who knew, maybe even a 2:15! (but that was not to be this time) Reckon I was able to keep up this pace right uptil the 16K mark. I probably did slow down a bit during the next two kms, but then I really hit the wall on 18K. Start feeling very exhausted, and it was tempting to just walk the last 3K. But, thankfully, I was able to give it my all and keep running -- albeit a little slowly -- in the last leg too :) As I neared the finish line, saw the clock ticking at 2:19 and counting -- I had managed to do it! Crossed the finish in just under 2:20 (my gross time was 2:19:56). I had never realized I could do this time -- in fact all my training runs were pointing to a 2:30+ 21K run! Felt a bit giddy after the race, but it was only for a few minutes. A nice Iodex massage (that was a great thing to do -- have volunteers massage your feet and legs after the race -- Mumbai are you listening?) and a banana and an apple later, I was feeling as good as ever. 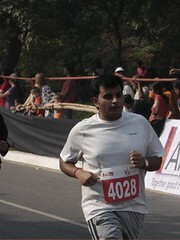 Next up is Running and Living marathon and a half in Gurgaon on December 6th, where I'll be running the 21K again, and then the half in Mumbai in January. Hope that fitness and timings keep improving, over the next couple of months, at least. It was wonderful to read your experience. It makes one feel to do the same to feel the kind of happiness and satisfaction I can read in those words and see in your face.